812 Naval Air Squadron was a Naval Air Squadron of the British Royal Navy's Fleet Air Arm, which was active between 1933 and 1956, and saw service in World War II and the Korean War. The squadron was first formed on 3 April 1933 aboard HMS Glorious, then part of the Mediterranean Fleet, by amalgamating No. 's 461 and 462 (Fleet Torpedo) Flights. Originally equipped with the Blackburn Ripon, these were replaced with the Blackburn Baffin in 1934, and the Fairey Swordfish in 1936. Apart from a short visit to the UK to take part in the 1937 Coronation Review at Spithead, the squadron remained in the Mediterranean until the outbreak of the war in September 1939. Glorious was then sent to patrol the Indian Ocean, but was recalled to home waters in early 1940, and 812 Squadron was transferred to RAF Coastal Command to take part in mining and bombing operations in the low countries and in the Dunkirk evacuation. In March 1941 the squadron left Coastal Command to take part in Malta convoy protection duties aboard HMS Argus. In July, aboard HMS Furious, they participated in the attack on Petsamo. Further Malta convoy duties followed aboard Furious, transferring to HMS Ark Royal in September. After the Ark Royal was torpedoed and sunk on 13 November, the squadron regrouped at Gibraltar. While based at RNAS North Front, the squadron received new aircraft equipped with ASV (Air to Surface Vessel) radar, enabling them to sink the U-boat U-451 on the night of 21 December 1941, and to damage five others. The squadron returned to the UK in April 1942 aboard USS Wasp (CV-7), and were reattached to Coastal Command in September to fly operations over the English Channel. On 18 December 1942, it was amalgamated into 811 Squadron. No. 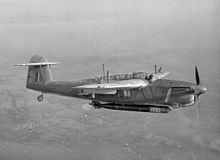 812 Squadron was reformed on 1 June 1944 at RNAS Stretton (HMS Blackcap) and equipped with the Fairey Barracuda. After short spells at RNAS Ballyhalbert (HMS Corncrake), Northern Ireland, and RAF Heathfield (HMS Wagtail), Scotland, the squadron embarked on HMS Vengeance in February 1945, along with 1850 Squadron, flying the Vought F4U Corsair, to form the 13th Carrier Air Group. Returning to the Mediterranean, 13 CAG were based at HMS Falcon at Hal Far, Malta, and flew exercises over Sicily. After the German surrender on 8 May 1945, the group were assigned to serve with the British Pacific Fleet. The group sailed for Australia aboard Vengeance, and were based at HMS Nabswick (MONAB V) at Jervis Bay from 22 July 1945, where they trained for the planned invasion of Japan. After the Japanese surrender on 8 August, they were temporarily based at Ponam in the Admiralty Islands, before being sent to Hong Kong, arriving at HMS Nabcatcher (MONAB VIII) at Kai-Tak, in October 1945, and remaining there until the end of the year. No. 812 Squadron was re-equipped with the Fairey Firefly, and returned to Australia in January 1946, where they were based HMS Nabthorpe (MONAB VI) at Schofields, New South Wales, while Vengeance was in dry dock for repairs. In March 1946 Vengeance and her squadrons returned to the UK, via Ceylon, and arrived at RNAS Lee-on-Solent (HMS Daedalus) on 12 August 1946, where 812 Squadron was disbanded. The squadron was reformed again on 1 October 1946 at RNAS Eglinton (HMS Gannet) in Derry, Northern Ireland, and joined 804 Squadron, flying the Supermarine Seafire, to form the 14th Carrier Air Group. In February 1947, 14 CAG sailed aboard HMS Theseus on a lengthy Far Eastern cruise, eventually returning in December. In August 1948 the group sailed for the Mediterranean aboard HMS Ocean, where Hal Far was used as a shore base. The group was transferred to HMS Glory in November 1949, and participated in several cruises and exercises, with landings being made on USS Midway (CV-41) in October. In March 1951 Glory sailed for Korea, where 812 Squadron flew 852 sorties over the next six months, during which three aircraft were lost and several others damaged by AA fire. After two months based in Australia, Glory returned to Korean operations, where the squadron flew another 689 sorties, with 104 of them flown in one day. In May 1952 the squadron transferred its aircraft to Ocean, and the crews sailed home in Theseus. In June 1952, the squadron was re-equipped with the Firefly AS.6 at RNAS Anthorn (HMS Nuthatch), and in September sailed aboard HMS Eagle for exercises and a visit to Oslo. In January 1953 the squadron joined Theseus for a cruise, returning to Eagle in June for exercises off northern Scotland. It was disbanded at Eglinton on 20 October 1953. The squadron was reformed for a third time at Eglinton on 7 November 1955 as an anti-submarine squadron, flying the Fairey Gannet. In April 1956 it sailed to the Mediterranean in Eagle, taking part in visits and exercises before flying home from Malta, and was disbanded on arrival at Lee-on-Solent on 13 December 1956. ^ a b c d e f g h i j Grice, Bill (2008). "812 Squadron". HMS Theseus. Retrieved 24 October 2011. ^ Barrass, M.B. (2011). "No. 712-825 Squadron Histories". Air of Authority : A History of RAF Organisation. Retrieved 24 October 2011. ^ "List of all Fleet Air Arm Commanding Officers 1939-1945". Fleet Air Arm Archive 1939-1945. 2005. Retrieved 24 October 2011. ^ Laws, Allan, "Fairey Swordfish: The Fleet Air Arm's enigmatic warrior", International Air Power Review, Volume 27, AIRTime Publishing Inc., Westport, Connecticut, 2010, ISSN 1473-9917, page 133. ^ a b c d Davis, Ron (2010). "No.812 Royal Navy Squadron". HMS Vengeance. Retrieved 24 October 2011. ^ "Fleet Air Arm Carrier Air Groups 1945". Squadron Database of the Fleet Air Arm Archive 1939-1945. 2005. Retrieved 24 October 2011. ^ Grice, Bill (2007). "14th Carrier Air Group". HMS Theseus. Retrieved 24 October 2011. This page was last edited on 3 March 2018, at 01:01 (UTC).